These Frames Were Made For Walking! l.a.Eyeworks put the finishing touches on John Bartlett's Fall 2009 runway presentation during New York Fashion Week. Styled by creative consultant Robert Bryan, frames such as Minnow, Chunny, Kilgallen, and Bodhi 2 perfectly accented Bartlett's 1920's and 30's inspired designs. Check out the video above to see l.a.Eyeworks in action. For more high resolution images from Bartlett's show, take a peek inside our l.a.Eyeworks in Fashion photo album where you can browse through snapshots of other runway collaborations! Every year, OTIS College of Art & Design hosts a runway show presented by the Senior Class and their mentors. Naturally, when design mentors Trina Turk and Johnson Hartig's student-designed collections called for some glamorous accessories, l.a.Eyeworks was chosen to provide stunning sunglasses. For Turk's collection, it was big, bold, and beautiful with Dosa, Calcutta, Sita, and Madras all making several appearances on the runway. For Hartig's collection, it was all about turn-of-the-century glam. l.a.Eyeworks' legendary Bodhi frame in charcoal, with mesmerizing mirrored lenses, donned just about every look. Click here to check out more videos from l.a.Eyeworks! l.a.Eyeworks adorned the fall fashion offerings by LA designer Corey Lynn Calter at last year's spring runway show during the Mercedes Benz Fashion Week. Between the comination of bold frames, and chic fashion, the collaboration was a smashing hit. 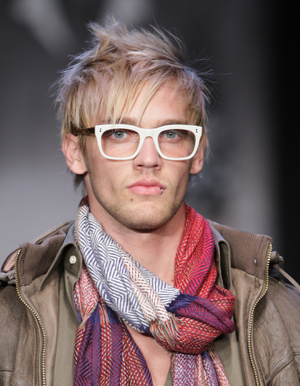 Make sure to check out l.a.Eyeworks on the runway again at this year's Mercedes Benz Fashion Week!